The 348 Challenge sports car from Ferrari was a single marque race Series, first set up in 1993, and aimed at amateur drivers. It was initially established in Europe and, within a year, had spread to the US. Originally, the Series centred on converted 348 Serie Speciale cars, but this was later extended to any 348 from 1989 onwards that reached 348 SS specification. In 1994, Ferrari introduced a limited edition of just 45 cars, consisting of 32x348 TB's and 13x348 TS's, targeted at the US market, that were designated the 348 Factory Challenge. The Serie Speciale sports cars included sills that were painted the same colour as the rest of the car, and this feature was carried over to the Challenge Series. These Challenge cars had road-going trim, and each received an individually numbered plate that was positioned on the right hand door frame. The cost of the optional Challenge kit from Ferrari was $14,000, and they indicated that, using this kit, it would take around 60 man hours to convert the original car to race trim. The 3.4 litre, double overhead cam, V8 engine used in the Challenge Series would develop an increased 320 bhp. The resulting racer would use slick tyres, and have an improved braking system, and upgraded aerodynamics. 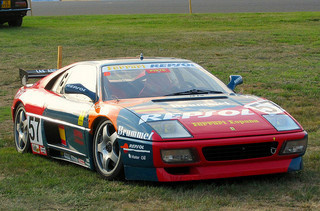 The 1995 season was the last in which the 348 Challenge car would be entered in race meetings since, by that time, it had been superseded by the Ferrari 355 Challenge model. The Serie Speciale sports car from Ferrari referred to a limited edition of 100 modified versions of the 348 TB and TS that was built between 1992 and 1993, and targeted at the US market only. Each sports car was individually numbered with a special plate positioned on the passenger's door post. Finally, in 1994, a further 15 units were built as a result of favourable demand. The 348 Serie Speciale was powered by the same 3.4 litre, double overhead cam, V8 engine that was fitted to the original variants. However, this unit was slightly modified, and developed 312 bhp at 7200 rpm, whilst still producing the same top speed, but with a marginal reduction in the 0-60 mph time of 5.3 secs.